In short sharp chapters introduced by 19th century anatomical diagrams (Neck, Bloodstream, Cranium…) Maggie O’Farrell details her sometimes near, occasionally more distant, brushes with death. Death visits her in many different forms which she brings to life with vivid and visceral prose. At the age of eighteen she encounters a murderer on a remote path; against all odds she survives a childhood illness; with deep sorrow she mourns the IVF babies she lost and she watches her daughter like a hawk constantly alert to the allergies which can cause fatal anaphylaxis. These are just some of the harrowing stories of human vulnerability lived by the author in this memoir – her first non-fiction book after seven highly successful novels. Mark Baker is well known for his bestselling memoir The Fiftieth Gate, a book in which he chronicles the journey he made with his Holocaust survivor parents back to Poland. But this book is a chronicle of a different kind. His beloved wife of 33 years, Kerryn, was diagnosed with an aggressive form of stomach cancer. She died ten months later. The thirty days of the title refers to the sloshim, a Jewish rite of mourning after burial. During that time, Baker goes to ground scouring his memories and his home trying to recapture the essence of a deep and loving marriage. His grief knows no bounds and the reader is inexorably drawn into that house of mourning. Thirty Days is hard going because the pain is so palpable and seemingly neverending. And yet, at the same time, it uplifts because of the love it bears. This remarkable memoir was first published in Geneva in 1945 and quickly fell into obscurity until a copy was found in a second-hand bookshop. Major French publishing house, Gallimard, republished it in 2015 to much acclaim and this edition has been sensitively translated by Australian Stephanie Smee with a moving preface by Nobel Prize Winner Patrick Modiano. In 1921 Frenkel, a Polish born Jewish Francophile, opened a French Language bookshop in Berlin, an enterprise that was very successful until the onset of the Nazi regime. She was required to close the shop and flee to France where she roamed from town to town seeking refuge. In a gentle but firm tone, Frenkel describes the people who helped her, her disdain for the collaborators and the desperation which surrounded her and many others in the same plight. Her husband was deported to Auschwitz but Frenkel eventually managed to make it to the Swiss border and safety. There is little documentation available about what happened to her afterwards but this memoir firmly places Frenkel in the upper echelons of autobiographers. Before reading "Barbarian Days" (William Finnegan's Pulitzer prize-winning surfing memoir), I thought surfers were a bit of a strange bunch. It didn't help that many of the depictions of surfers that have permeated pop culture over the years (whether in films, on television or in fiction) have tended to portray surfers as lovable clowns - as either harmless stoners or long-haired zen monks. This is what makes Finnegan's book such a welcome arrival. 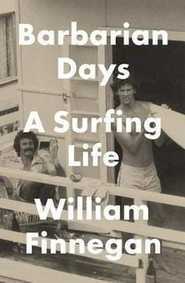 Simply put, "Barbarian Days" is the best written portrayal of the sport of surfing and its practitioners since Tim Winton's "Breath". Combining an anthropologist's eye for detail, a novelist's insight into human psychology and plenty of exotic locations, all within a thrilling narrative, Finnegan's memoir is more than simply a celebration of its subject. It is a refreshingly clear-eyed, and yet deeply nuanced account of what seems from a distance like such a simple activity. It turns out surfers are a bit of a strange bunch. Reading this book might just leave you wanting a little more strangeness in your life. Alexandra Joel has written the astonishing true story of her great-grandmother Rosetta, a woman from an upright middle class Melbourne Jewish family, who, in 1905, not only abandons her very young daughter but does so in the company of a half Chinese fortune teller called Zeno the Magnificent. In London they revel in the company of top aristocrats and famous writers such as Conan Doyle. Ably assisted by Rosetta, Zeno make a fine living as a hypnotist, masseur and counsellor. It’s a story hard to imagine but it is based on the impeccable research of the writer’s father Asher Joel, a prominent eastern suburbs politician, journalist and public relations. Although the author recreates conversations and internal monologues she does so in a thoroughly plausible manner fully supported within the trellis of the factual. Alex Miller is a prolific writer who has won numerous awards including the Miles Franklin twice and the Commonwealth Writers’ Prize - deservedly so. This is a treasury of rich, wistful memoir, excerpts from his novels, some poetry and is peopled with many who have inspired his writing. It is a fascinating insight into the experience of writing and the way his craft has developed over many years. His early years in England were to form the foundation for his writing life which was slowly honed after his arrival in Australia. Not only is Miller prolific but the subjects of this novels are so various and different from each other – the aboriginal experience, the migrant’s journey, the artistic life – that one wonders how he taps into these lives. And this book provides some answers. When Helen Macdonald’s father died, she felt a pull towards the wild. Having romanticised falconry since a child, she decided to finally buy and train her own goshawk, a bird notorious amongst centuries of falconers for being sulky and unpredictable. Helen has a very different experience with her goshawk, Mabel, and discovers that far from being the ‘hysterical, irrational’ bird depicted in falconry books, Mabel hunts with a blood-lusty vigour, but also likes to play catch with a small paper ball, and responds to patient, gentle human interaction. Woven between fragments of Helen’s memoir is the story of T.H. White (author of The Sword in the Stone) and his failed attempts to train his own goshawk in the 1930s. Part critical reading, part biography of a man struggling to come to terms with his repressed homosexual desires, White’s story helps Helen, and her readers, understand the impulse behind wanting to capture and train a wild animal, and the exchange that takes place between human and bird, bird and human, in the process. Macdonald is a poet and it shows in her prose. Her landscapes are smelly, brittle, and vivid. Her lyrical turn of phrase enables a deft navigation of grief without ever collapsing into self-indulgence. H is for Hawk is the perfect book to snuggle up with when wild weather is lashing against your bedroom windows.